If you are seriously interested in researching a fish species for your aquarium, knowing its common name is not enough. If you check an encyclopedia for "tetra," for example, you may get some basic information, but you may learn a lot more if you research the fish by its official Latin name. While common names often are based on visual appearance or observed behavior, each fish is categorized genetically and scientifically for classification purposes. This is the name used in scientific and medical literature. The common diamond tetra, for example, is known as Moenkhausia pittieri, and you will learn a lot more by investigating it by this name. This list gives fish names beginning with the letter "D." They are alphabetized according to the common name with scientific names also given. Misgurnus angullicaudatus: This fish also goes by other common names, including the weather loach, Japanese loach, Oriental weatherfish, and pond loach. It is a large (usually 12 inches), peaceful and long-living fish, often surviving up to 10 years. This long, eel-like fish has been used to predict the weather (hence the name weatherfish). When storms approach, it is known to swim wildly about, apparently responding to changes in atmospheric pressure. The dojo loach will happily coexist with other species but needs a tank of 20 gallons or more. They are extremely social, and some owners have reported that their loaches even like to be petted. Gobioides broussonnetii: This is a highly unusual species that is not for everyone. Also known as a Peruvian gobi or violet gobi, it can grow up to 25 inches and prefers brackish waters. When kept by enthusiasts, it is often kept in its own tank. It has a long body with sharp spines on its fins, and an underslung jaw with sharp teeth that make the name dragon fish well deserved. It is, however, relatively mild-mannered, and in a mixed aquarium, it is often out-competed for food. In its natural habitat, it scavenges rather than hunts, despite its ferocious appearance. It is one of the most unusual-looking of all aquarium fish, making it a prize for those seeking something unique. 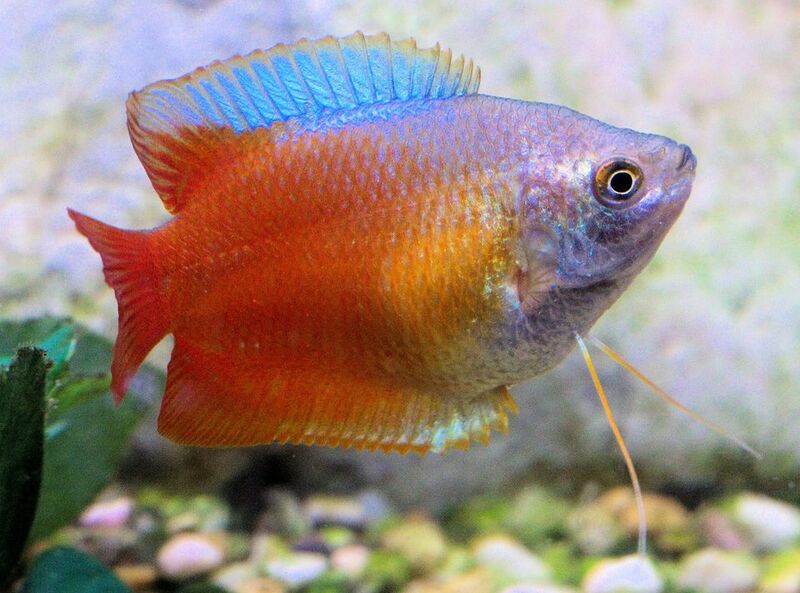 Colisa lalia: The dwarf gourami, so-named for its maximum adult size of two inches, is a colorful and shy little fish that thrives in aquariums as small as five gallons. It is a peaceful fish that does well in mixed-species aquariums populated with other peace-loving fish. Do not place them with larger, aggressive species, as they will be unable to hold their own. Dwarf gourami prefer tanks with plenty of vegetation and hiding places. Channa gachua: This is among the smallest species of the snakehead family, growing to a maximum of 8 inches, making it suitable for aquariums. Although its name implies a reptilian appearance, it is actually an attractive, long-bodied fish with pronounced fins. It prefers a dimly lit tank with plenty of plant cover. The tank should be covered, since the snakehead has been known to jump out of its aquarium. This is fish for enthusiasts looking for something out of the ordinary.